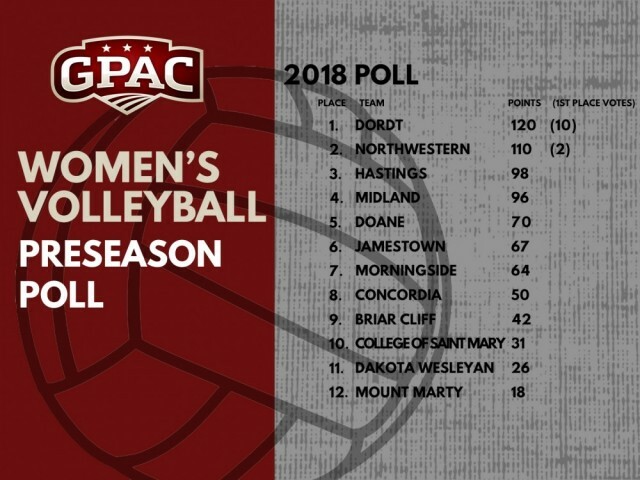 Dordt College, runner-up in the NAIA in 2017, tallied 120 points and was picked first in the 2018 Great Plains Athletic Conference (GPAC) Preseason Coaches’ Volleyball Poll. The Defenders garnered ten of twelve first place votes. Northwestern, who was picked second with 110 points, received two first place votes. Hastings was picked third with 987 points, while Midland fourth with 96 points. The University of Jamestown, in their first year as a member of the GPAC was tabbed sixth with 67 points. Dordt, Northwestern and Hastings were the GPAC regular season tri-champions in 2017. Each team compiled a 14-2 record last fall. Hastings won the GPAC Tournament by defeating Dordt. The 39th Annual NAIA National Volleyball Championship is set for November 27-December 1, 2018, at the Tyson Events Center in Sioux City, Iowa. The GPAC regular and postseason champions will earn the automatic berth to the NAIA Volleyball Championship. The NAIA Volleyball Championship will consist of 44 teams in 2018, with 32 advancing to the final site in Sioux City, Iowa. There will be 20 automatic qualifiers for the final site from the final ranking (top 19 plus local host). The other 12 teams will come from Opening Round winners played on November 17, 2018, at on-campus sites. The 2018 GPAC volleyball season will consist of 16 conference matches with 12 teams competing for the conference crown. Coaches were not allowed to vote for their own team in the preseason poll. This entry was posted on Thursday, August 9th, 2018 at 2:59 pm	and is filed under Sports. You can follow any responses to this entry through the RSS 2.0 feed. Both comments and pings are currently closed.